Date/Time: Wednesday, April 17, 2019 at 7:00 p.m. Location: Room AQU 216 in Aquinas Hall, Mount Saint Mary College, Newburgh, N.Y. If these symptoms occur for more than 2 weeks and are new and unusual for you, see a gynecologist and ask about ovarian cancer. Research shows that seeing a gynecologic oncologist for surgery and treatment significantly improves outcomes. 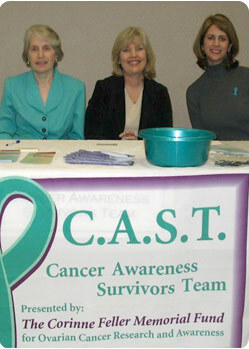 To accomplish its awareness goals, the Corinne Feller Memorial Fund established C.A.S.T. (The Cancer Awareness Survivors Team). C.A.S.T. is made up of ovarian cancer survivors from the Hudson Valley who empower others by sharing their experiences. They’ve been trained to discuss their symptoms, diagnosis, treatment, and recovery in a concise, easy to understand manner. The Corinne Feller Memorial Fund has also produced an educational video that is presented along with the survivors’ testimonies. C.A.S.T. makes free presentations monthly to women’s groups and medical professionals throughout the Hudson Valley. The Corinne Feller Memorial Fund is taking part in the national Turn the Towns Teal effort. Teal ribbons will be tied on trees in towns throughout the Hudson Valley to recognize September as Ovarian Cancer Awareness Month. Through these presentations, the Corinne Feller Memorial Fund hopes to raise awareness about the vague symptoms of ovarian cancer and increase early detection rates. Learning the symptoms of ovarian cancer is vital because early diagnosis greatly increases chances for survival. Currently, almost 70 percent of ovarian cancer patients aren’t diagnosed until the disease is in its advanced stages. Each year, 27 thousand new cases of ovarian cancer are discovered, and more than 14 thousand women die of the disease. There is currently no effective screening tool for ovarian cancer, making awareness critically important.